Adirondack Vacation Guide: Lace up your skates! Olympic Oval now Open! Lace up your skates! Olympic Oval now Open! 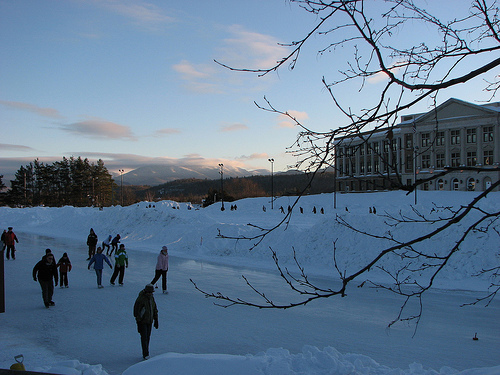 For 07-08 there is public skating weekdays (except Tuesday) from 7-9 pm and weekends/holiday periods from 1-3 pm and 7-9 pm. Bring your skates or rent for just $3 a pair. A bit of history: at the 1980 Olympics, speed skater Eric Heiden won all five events here (a record breaking 5 gold medals! 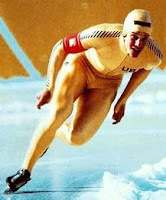 ), setting four Olympic records and a world record in the 10,000 meter. He beat the record by 6.2 seconds after oversleeping following the legendary Miracle on Ice USA vs USSR hockey game the night before! Check conditions and the oval webcam via ORDA. Call (518) 523-1655 for more information.